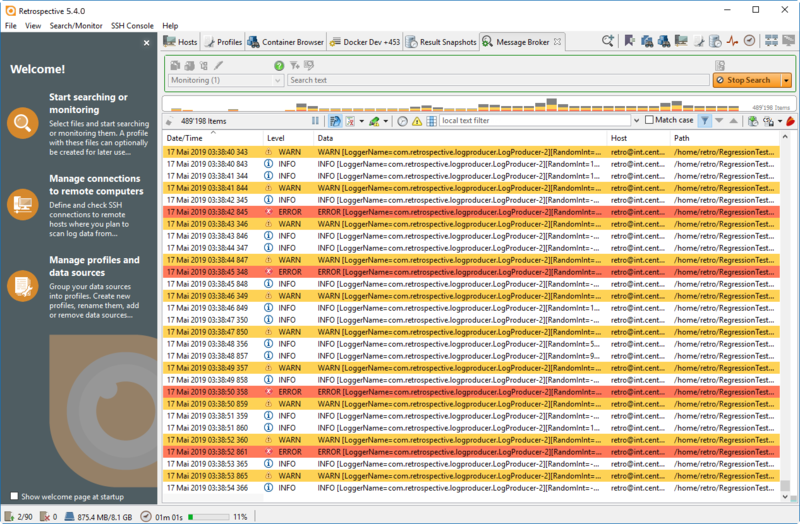 Retrospective (Enterprise) 2.2.0 Free Download - A powerful tool for finding your data in either log files or database tables. Retrospective is a faster and better way for IT people to manage their enterprise log data on either Windows, Mac or Linux. It was initially created by us simply because there wasn't any other adequate tool available for the 'real-world' problems which our Environment Management , Test and Operations Support teams were being confronted with for many years at different customer sites. Whether you develop Software, integrate systems, have to carry out massive tests or are in support and struggle with problematic tickets, Retrospective enables you to instantly search through distributed logs and get instant data transparency. In addition, if you need to keep a 'real-time' eye on different logs, Retrospective offers you a 'tail'feature that conveniently merges the different tailed logs into one unified view. With Retrospective there is no expensive and time consuming analysis of your IT landscape, building of centralised log storage or complex indexing but just a fast, easy and ad-hoc way to access to your data. Whenever you face an issue that may be reflected in your logs, Retrospective is the right tool to successfully find a solution within minutes. A personal license costs just $58.00. This may be purchased by private persons who use their own funds to obtain the product for commercial or private purposes. Personal Licenses bought or reimbursed by a company are invalid. A company license costs $215.00 and also includes one year free support. Companies should request a special quote if ordering three or more licenses. Statement: First, please download the orginal installation package by clicking the download link. Of course you may also download it from the publisher's website. Using Retrospective (Enterprise) crack, key, patch, serial number, registration code, keygen is illegal. The download file hosted at publisher website. We do not provide any download link points to Rapidshare, Hotfile, Depositfiles, Mediafire, Filefactory, etc. or obtained from file sharing programs such as Limewire, Kazaa, Imesh, Ares, BearShare, BitTorrent, WinMX etc. Software piracy is theft. If you like Retrospective (Enterprise) please buy it.